The United States is lagging behind other countries in science and math, but some companies are taking unique steps to encourage future engineers. Global power and automation company ABB and Marbles Kids Museum are launching a one-of-a-kind, play-based power grid exhibit called Kid Grid to generate interest in science, technology, engineering, and math (STEM) in young children. Kid Grid, located at Marbles Kids Museum in Raleigh, NC, opens recently and was funded by a $1 million grant from ABB. Kid Grid playfully introduces young children to electricity and power grid technology through hands-on, minds-on play. Kids explore a pretend power grid and learn how to make smart energy choices. The exhibit promotes early learning in STEM education, inspiring the next generation of great minds through interaction and energy stimulation to power up a bright future. Engineering companies have a vested interest in maintaining an educated workforce and breaking through traditional gender stereotypes. A shortage of American engineering graduates leaves many high-tech companies struggling to fill jobs. In 2012, high school students from 29 industrialized nations outperformed the United States in math, and 22 nations outpaced the them in science. Projects such as Kid Grid are designed to give children positive encouragement in STEM education at an early age. ABB employees and families collaborated with Team Marbles during initial design, brainstorming creative ways to get kids talking about energy. Engineers and experts from ABB continued to provide guidance and knowledge throughout design and construction to ensure Kid Grid accurately reflects a real power grid. Kid Grid is complete with play versions of cables, control systems, motors, towers, and transformers as well as real equipment provided by ABB. ABB and Marbles announced the project in October 2012 as the single-largest gift in the museum’s history. Kraemer Design and Production of Cincinnati designed the exhibit, and fabrication began in fall 2013 at Pacific Studio, an exhibit production company in Seattle. In partnership with Wake County, Marbles began construction of the building addition in December 2013. In April, exhibit components were shipped 2,851 miles from Seattle to Raleigh to be reassembled at Marbles. STEM industry jobs also offer benefits of their own. According to the U.S. Department of Commerce and Economics and Statistics Administration, individuals employed in STEM jobs consistently earn wages up to 26 percent higher than their non-STEM counterparts. In fact, eight of the top ten college degrees, as ranked by income, were in STEM fields. Marbles Kids Museum provides learning experiences for children through hands-on children’s exhibits, creative programs and events, and larger-than-life IMAX movies on North Carolina’s only giant screen. Located in downtown Raleigh, Marbles offers museum and IMAX field trips, summer camps, family events, targeted outreach programs and exceptional spaces for meetings and events. For more information, visit www.MarblesKidsMuseum.org or www.IMAXRaleigh.org. ABB (www.abb.com) is a leader in power and automation technologies that enable utility and industry customers to improve performance while lowering environmental impact. The ABB Group of companies operates in around 100 countries and employs about 147,000 people. ABB’s North American operations, headquartered in Cary, NC, employ more than 30,000 people in multiple manufacturing, engineering, and service capacities. GHT Limited (GHT), a DC metro area mechanical, electrical, and plumbing (MEP) engineering firm, has announced it has achieved LEED Gold certification for its Arlington, VA headquarters under the Commercial Interiors (LEED-CI) rating system. The 19,100 square-foot space features 100-percent LED lighting and achieved a lighting power density 40.75% below ASHRAE requirements. To read more about the project’s sustainable design features, visit www.ghtltd.com/sustainablespace. Based in Arlington, VA, GHT helps optimize building performance by providing sustainable mechanical, electrical, and plumbing (MEP) engineering services for commercial office buildings, tenant interiors, and government properties as well as institutional, hospitality, and mission critical environments. GHT's areas of expertise include MEP system design, commissioning, building energy services, and real estate advisory services. Learn more about GHT at www.ghtltd.com. 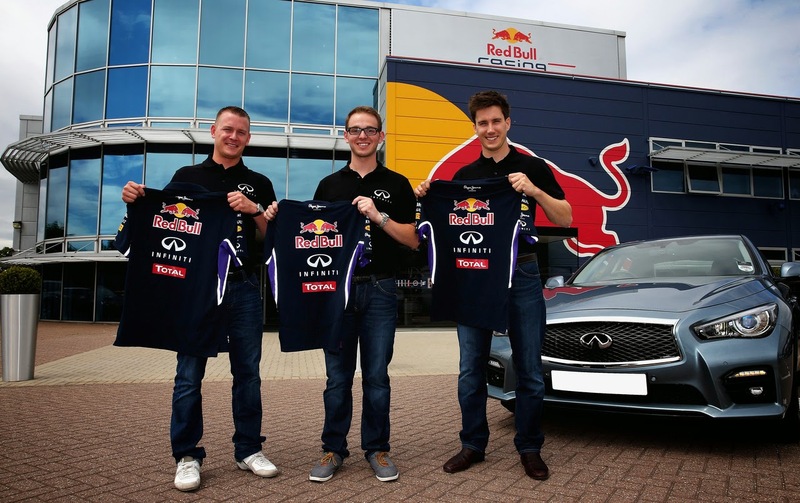 Infiniti has announced the winners of its global talent search initiative that will see three engineering students given a career opportunity with Formula One team Infiniti Red Bull Racing. After a grueling three-day world final event in the UK that saw 12 hopefuls from around the world competing for victory in the Infiniti Performance Engineering Academy, William Priest from Chesham, Buckinghamshire, UK; Eric LaRoche from Hamilton Square, New Jersey; and Jason Zide from Laguna Beach, California were deemed the winners. They were judged by a panel of senior engineering personnel from Infiniti and the race team, led by Chief Technical Officer Adrian Newey. Along with a 12-month work placement with the team beginning in September, the winners will receive accommodation in the UK, an Infiniti company car, and full salary. With the in-depth assessment process split between Infiniti’s Technical Center in Cranfield, UK and Infiniti Red Bull Racing in Milton Keynes, UK, the final candidates, selected from over 1,500 entrants across 100 top engineering universities worldwide, faced a series of challenges over three days relating to road car and racing car engineering. These included practical design tasks, written exams, intense interviews, and complex group exercises to test their technical ability, teamwork skills, and performance under pressure. In one task they even got a first-hand insight into the role of a race engineer by working alongside four-time World Champion and Infinti’s Director of Performance Sebastian Vettel in the team’s simulator. William Priest, 23, studies mechanical engineering at the University of Exeter. Enthusiastic about motor sports, the British student previously gained experience working as a race engineer with the TH Motorsport British Touring Car team where he assisted the setup and preparation of the race cars. Familiar with Infiniti Red Bull Racing, he also spent two weeks working with the Formula One World Champions in the design department. Eric LaRoche, 25, studies mechanical and aerospace engineering at the University of Maryland. He has a passion for motor sports and aviation and, in addition to participating as lead aerodynamicist with the University of Maryland’s Formula SAE team, has gained experience with Chrysler’s Viper GTS-R team in the American Le Mans Series and worked at aviation giant Boeing. Jason Zide, 21, studies mechanical engineering at the University of Southern California. He is team captain of a Formula SAE team and is familiar with the Infiniti family, having completed work experience with the auto brand at its North American Technical Center.